Some of the design challenges will include how the roundabout would handle the intersection’s grade. And, in response to another question, Le reiterated that the eventual design might not resemble the existing concept rendering, which dates back a few years. HPAC leadership and attendees had lots of questions about how the proposed roundabout might work, and the bottom line right now is that it’s too early in design to tell. Some things mentioned: Maybe there would be a barrier about halfway down the hill. If you’re interested in seeing the city step this project up, lobby the City Council, because they too have the power to allot money. Meantime, what about other urgent Highland Park transportation-safety needs? asked HPAC vice chair Gunner Scott. “What can be done at this point to start putting this on the map so people can see there’s some progress happening? … What can we do now?” Le said his scope of involvement is limited to the roundabout project and HPAC would have to talk to a Transportation Operations rep. Could a crosswalk – envisioned as part of the roundabout project – be installed first? Omana asked. Short answer from Le, it’s more complex than it sounds, so, no. ONE MORE TRANSPORTATION NOTE: Later in the meeting, Omana mentioned he’s also talking to SDOT about left-turn signals at 16th/Holden. DELRIDGE TRIANGLE: Kim Barnes (who you might know as Westwood-Roxhill-Arbor Heights Community Coalition co-chair) spoke about her project to get this spot improved. A Your Voice, Your Choice grant has been awarded to get it designed; a separate grant would be needed to be built, and a Neighborhood Matching Fund grant is being sought. Barnes came in hopes HPAC would support that. She also invited everyone to Roxhill Park‘s newly announced June 9th community barbecue. CITY UPDATES: Scott mentioned that Andres Mantilla, the acting Department of Neighborhoods director, is a Highland Park resident and was in attendance at last week’s Delridge Neighborhoods District Council. He also mentioned the request for feedback on SDOT‘s search for a new director. RV PARKING: One of the city’s hottest topics came up at HPAC too. Discussion centered on what are, and aren’t, the current rules. RVs are parking at Riverview, attendees said. They’re going to invite SPD leadership to a future meeting, and perhaps other department reps. SPEAKING OF THE CITY … MAYORAL VISIT: Scott invited the mayor to Highland Park, and she accepted, during her Town Hall meeting at the Senior Center of West Seattle. HPAC is still working on scheduling this. FUTURE MEETINGS: HPAC meets fourth Wednesdays at HPIC (1116 SW Holden), 7 pm, all welcome. Watch hpacws.org for updates between meetings. 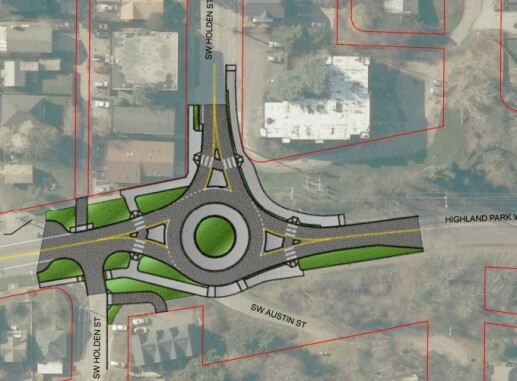 7 Replies to "From the roundabout to the triangle @ Highland Park Action Committee"
half a million to design a roundabout?waiting for the city’s model blue print to come out for people to add tiny housing in their backyard – what’s that blue print gonna run – $200k per copy? Worst. Idea. Ever. Anything that involves the potential of cars coming up that hill having to stop or slow down will create massive issues with uphill jams, backups and breakdowns, not to mention the sheer idiocy of two lanes of fast-moving bi-directional traffic having to merge into one on the approaches.Stop wasting civic funds on this hare-brained boondoggle. Traffic calming would be a feature, not a bug. Traffic or fatalities? I’d prefer the later. The plan needs to keep 2 SB, uphill, lanes. Otherwise significant queuing will result, trucks and busses struggle with the grade and the traffic volume is such a significant SB to WB traffic movement exists, especially in the PM commute time. Or Traffic over Fatalities…There was an accident a here a couple of hours ago. Not sure if there were injuries. There are signals at 35 and the WS Bridge, Columbian Way and 15th on Beacon Hill- Eventually traffic needs to slow down as it moves into pedestrian areas. Don’t know if one or two lanes are better for the roundabout but there are far too many accidents at this intersection, crossing 9th to the bus stop is unsafe, speeds on Holden are ridiculous, and one lane or two, SDOT needs make this area safer for all users. Slowing traffic is part of the solution not something to avoid.